Mayo Synchronicity, Part II: Mayo’s Arizona employees take Gold! Well, I was right. 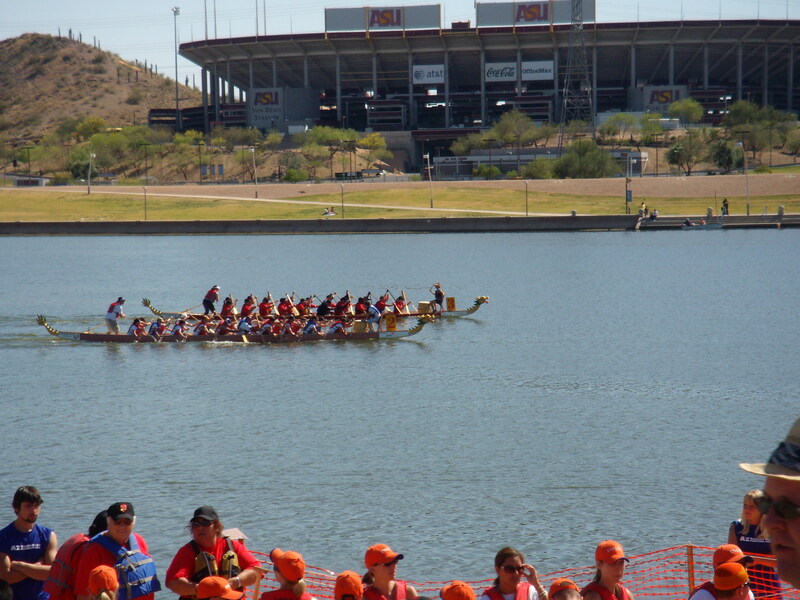 The AZDBA dragon boat race competition last weekend was a success! Even better, Mayo Synchronicity took Gold in the Corporate team race and Bronze in one of the mixed team division races. Our win was greater than the Gold medal because it was accomplished with the same shared teamwork, collaboration, and team spirit that we embody and demonstrate when we serve our patients. With three competing boats and the sponsorship of other teams, we competed against five other corporate teams -- campus teams from the University of California - San Diego, UCLA, and Manitoba High School, and a host of interstate and community teams ready to row their teams to Gold. The Mayo Clinic team advantage in these races was in our name -- Synchronicity. After speaking with Pam, service coordinator in Radiology, another first-time Mayo team rower, she agrees, "Synchronization is the key. Timing is everything. We were digging for Gold in that Tempe Town Lake, and we found it!" The races began at 8 a.m. on Saturday. It was a sunny, but windy day. The wind was not to our advantage as we rowed west because it blew south. Our land and boat cheerleaders brought pom poms, boisterous voices and shouted words with rhyme and rhythm to cheer us on. "Mayo Team 1 - you got the job done. Mayo Team 2, you know just what to do. Mayo Team 3 - you look so good to me." The wind died down for Sunday’s semifinals and final races. But the cheerers did not. Pam was doing her best to outlast fellow rower, Carol, a patient financial services clerk. After all, Pam was the team captain of her high school cheer squad, but Carol was on a mission! Carol was determined to be the strength and encouragement her team needed to row across the finish line. At her seat in the boat, she had her paddle and two pom poms. Her zeal and unending cheers, even at times of fatigue, has her notably known as our Spirited VIP. Mayo Clinic has participated in these dragon boat races at Tempe Town Lake since the inaugural event in 2004. Our competitive, yet kind spirit has become a stable presence at these races. We seem to bring on the contagious enthusiasm that carries the teams through 16 hours of races. Not to seem braggadocios, but from a first-timers perspective, the event would not be the same if Mayo Clinic did not show up. After all, we have the coveted medals, "Best Team Cheer" award, and "Spirit of Qu Yuan Award" to prove it. The "Spirit of Qu Yuan Award" goes to the team that best embodies the spirit of dragonboating and is a very prestigious honor to earn. Mayo Synchronicity has won this award for an unprecedented fourth consecutive year, and it is a testament to how great the paddlers, cheer squads, family members, and volunteers are at Mayo. Now that I have added rowing to my weekly workout, and I am about two cans short of my desired six pack. I will keep working at it and training for next year’s races. As I sit on the rowing machine in my neighborhood fitness center, I will recall our chants and cheers, "We ALL paddle, work, and live in a Mayo dragonboat."